Wash and pat dry the bitter gourds. Slice them thinly using a mandoline or knife. Place the sliced bitter gourds in a large mixing bowl. Add all the ingredients (except water) and mix well to coat. Add water little at a time and mix well. Let it sit for 10 minutes. Spread the bitter gourd slices onto the baking sheet in a single layer, Bake them for 30 to 45 minutes, flipping the discs in between. Once they are crispy, remove from the oven. 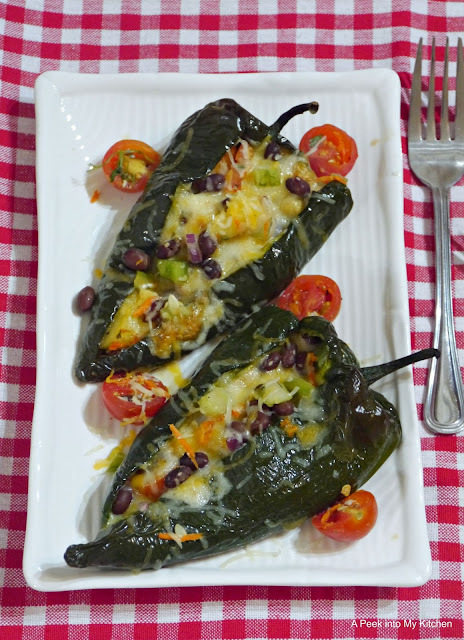 Quinoa stuffed poblano peppers loaded with black beans and veggies. 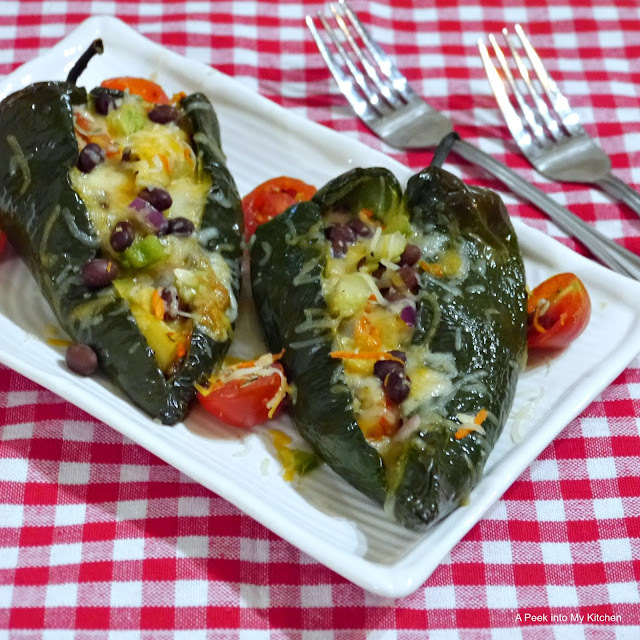 These super easy and healthy stuffed peppers make a great complete meal by itself. The stuffing is very versatile - you can add any grains (like rice), vegetables, and spices. Any type of cheese can be substituted as well for this recipe. Preheat oven to 400 degrees F. Line a baking tray with parchment paper or aluminum foil. Wash and pat dry the poblano peppers. Slit the peppers in the middle and remove the seeds. Coat oil on all the peppers and set aside. In a large mixing bowl, combine all the ingredients for the stuffing. Let it rest for 10 minutes. Spoon the stuffing into the poblano peppers about 3/4 full. Top it with pepper jack cheese. Place the peppers on a baking tray and bake for 20 minutes or until the peppers are fork tender. Remove from the oven and sprinkle with Mexican cheese. Serve hot with a side of sour cream, if desired. This spicy, rich and creamy lentil dish is made with whole balck lentil or urad dal and kidney beans. 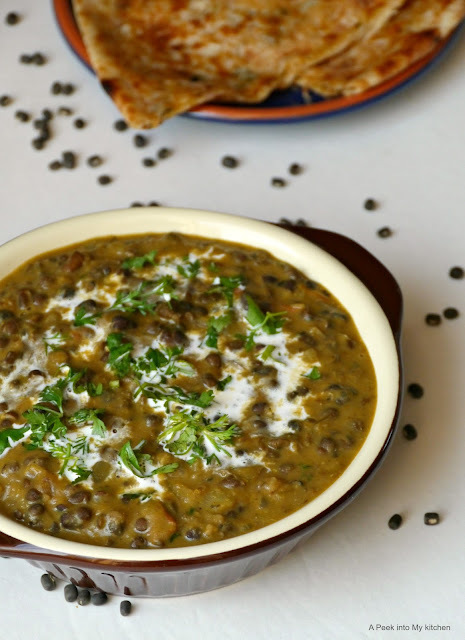 It is a very popular Punjabi dal (lentil) curry often referred to as the "king of all dals" due to the addition of butter and cream. 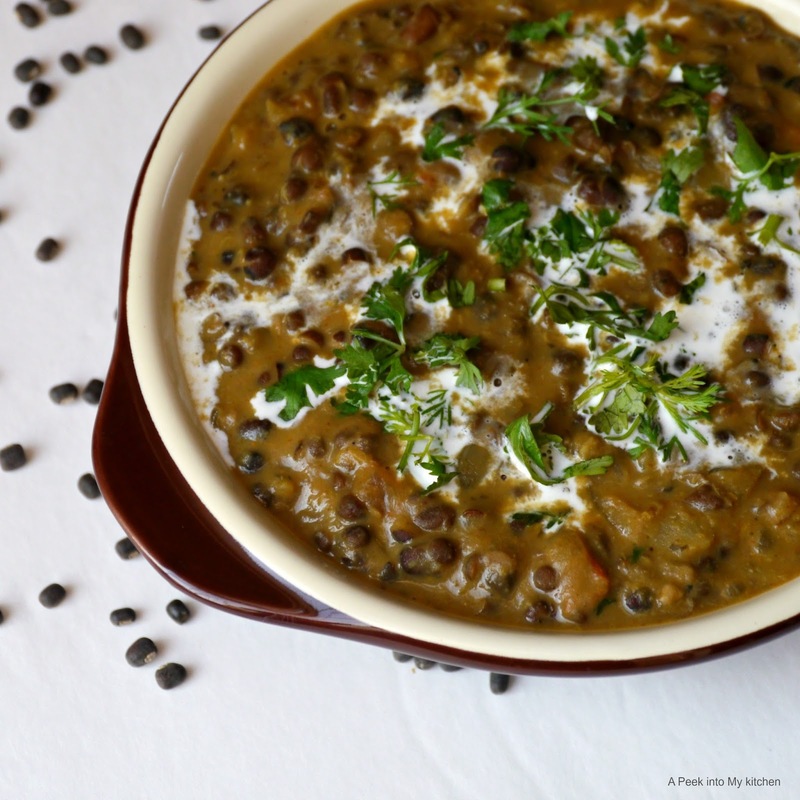 A low-fat version of Dal Makhani can be made by adding oil and low-fat milk instead of butter and cream. Wash and soak whole black urad dal for eight hours or overnight. Drain the water and pressure cook the dal with 4 cups of water for 5 to 6 whistles or until soft. Mash it well and keep aside. Heat butter in a deep skillet or saucepan. Splutter cumin seeds, Add the chopped onion and ginger-garlic paste. Saute until the onions turn soft. Add the chopped tomato. coriander powder, cumin powder, red chili powder, and red chili powder. Cover and cook over low heat until the tomato turns soft and the butter separates. Stir in the heavy cream or milk. Bring the dal to a gentle boil and remove from the heat. Serve hot with chapati, naan, or steamed basmati rice. Make your next cup of chai / tea a healthy and flavorful one by using jaggery instead of white sugar. 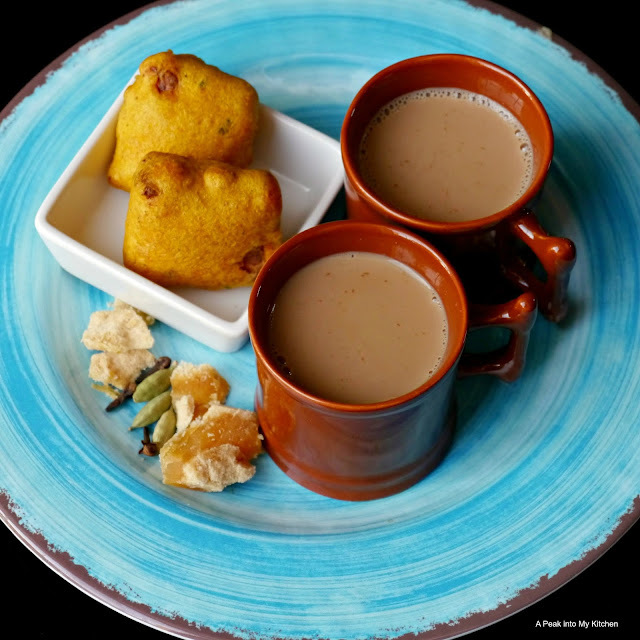 Jaggery is an unrefined sugar made from sugar cane juice. 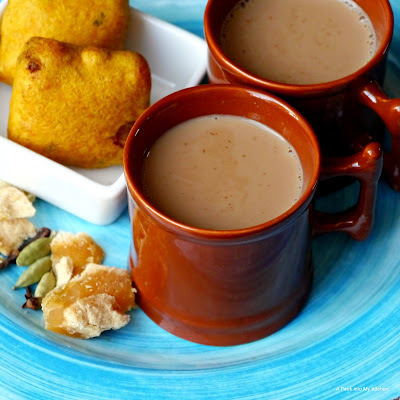 There are many types of jaggery made from different plants that are available in the Indian supermarket or online. Here is some more info on jaggery. In a medium saucepan, place 1 1/2 cups water. Add 2 tbsp tea or 3 tea bags, jaggery, ginger and tea masala. Bring the water to a boil. Add milk and simmer for 2 to 3 minutes. Strain in your favorite cup. 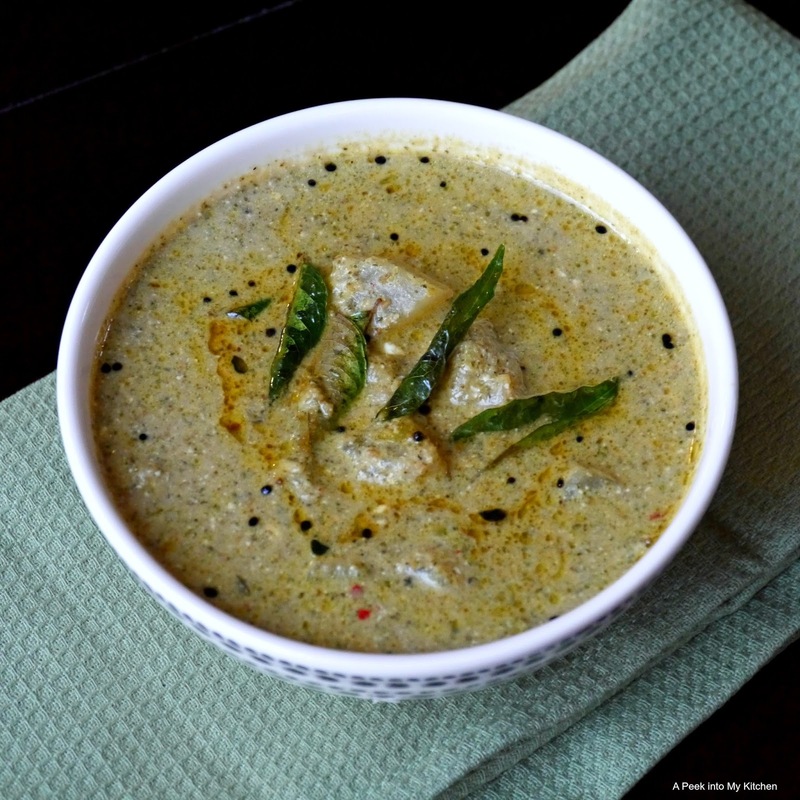 A cool and refreshing twist to one of my favorite dishes from Southern India, Mor Kuzhambu. Plain yogurt combined with mint and coconut paste with some spices make this dish so flavorful and delicious. 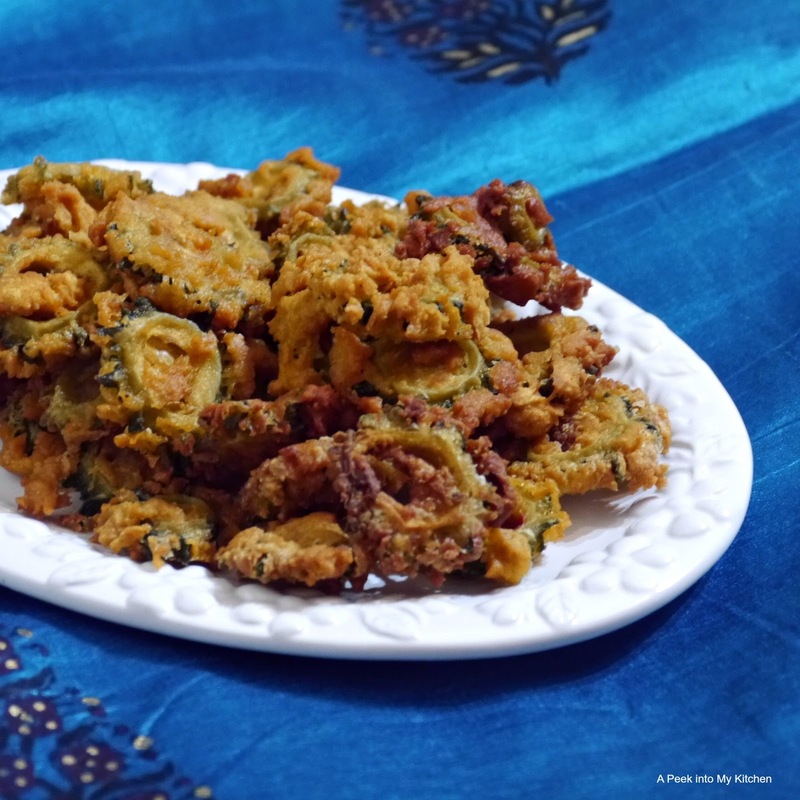 You can add any vegetable like okra, green pepper, brinjal (eggplant), or colocasia (sepankizhangu). But the winter melon/ash gourd/poosanikai pairs best with this mint kuzhambu. Cook the vegetable in enough water until soft. Keep aside. Meanwhile, roast urad dal, peppercorns, cumin seeds, red chilies, green chilies, and ginger in 1 tsp oil until golden brown. Add the roasted gram dal and saute for 2 minutes. Add the mint leaves and saute until wilted. Let cool and grind to a smooth paste along with coconut. Whisk the yogurt, turmeric powder, asafoetida, and salt with 1 cup of water. Whisk in the ground paste and cook until frothy, over low heat. Don't let it come to a boil. Add the cooked vegetable and simmer for 5 minutes. If the gravy is too thick, thin it down with 1/2 cup of water. Remove from the heat. Heat 2 tbsp oil in a small skillet. Splutter mustard seeds and curry leaves. Pour the tempering over the gravy and give it a stir. Easy and healthy stir fry using a Chinese green called Yu Choy. Yu Choy belongs to mustard family and is related to cabbage and bok choy. 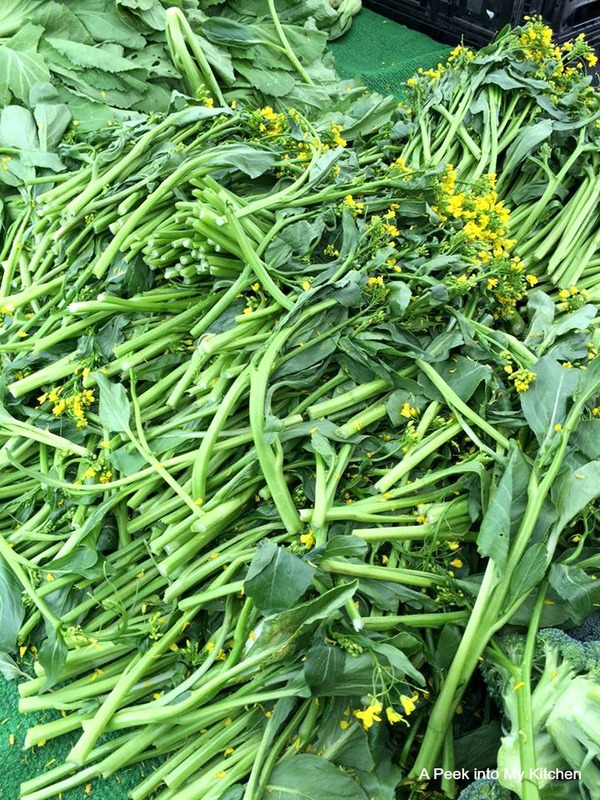 It has pretty yellow edible flowers like mustard plant. Yu Choy when cooked has a slightly bitter and peppery taste to it. It is widely available in Asian supermarkets. Heat oil in a skillet. Splutter mustard seeds. Add urad dal and cumin seeds. Fry until golden brown. 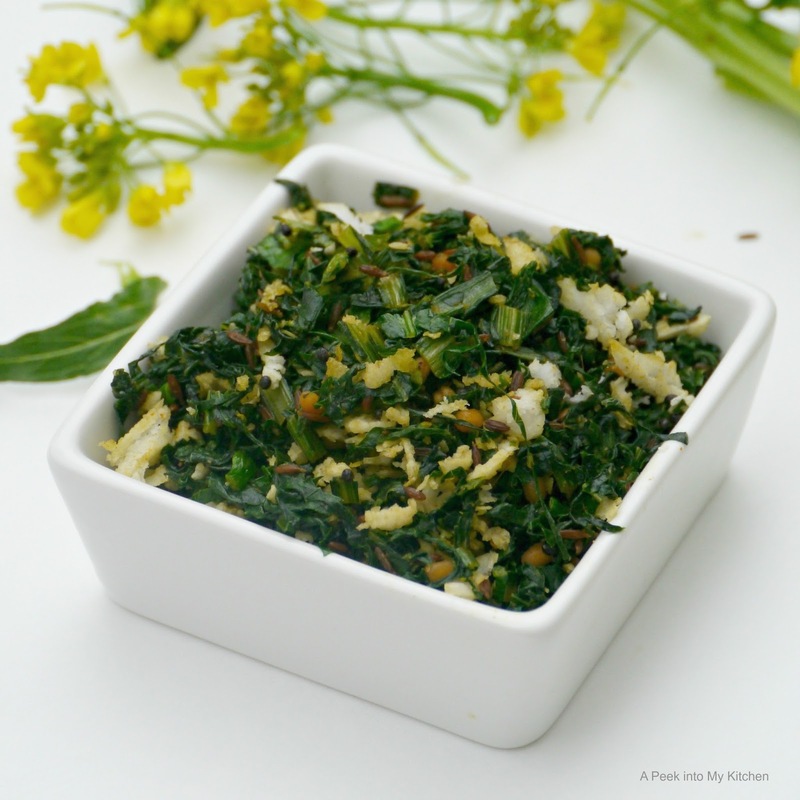 Add the chopped greens along with sambar powder, turmeric powder, asafoetida, and salt. Stir well. Sprinkle a tablespoon of water, cover and cook until soft, about 7 to 8 minutes. Turn the heat and add the coconut. Mix well. Serve as a side dish with any rice. Light and fluffy pancakes made with rich and creamy ricotta cheese. Mashed banana adds a natural sweetness to these delicious pancakes, while the lime zest gives a hint of citrusy flavor. In a large mixing bowl, combine the flour, sugar, baking powder, baking soda, salt, and lime zest. In another mixing bowl, whisk together the milk, ricotta cheese, mashed banana, and vanilla extract. Make a well in the flour mixture and pour the ricotta mixture. Gently stir to form a lumpy batter. Do not over mix. Heat a cast iron griddle over medium-high. Pour 1/4 cup of batter onto the pan and cook until bubbles form on top, about 2 minutes, over medium-low heat. Flip the pancake cook for a minute or until golden brown. Repeat the process with the rest of the batter. 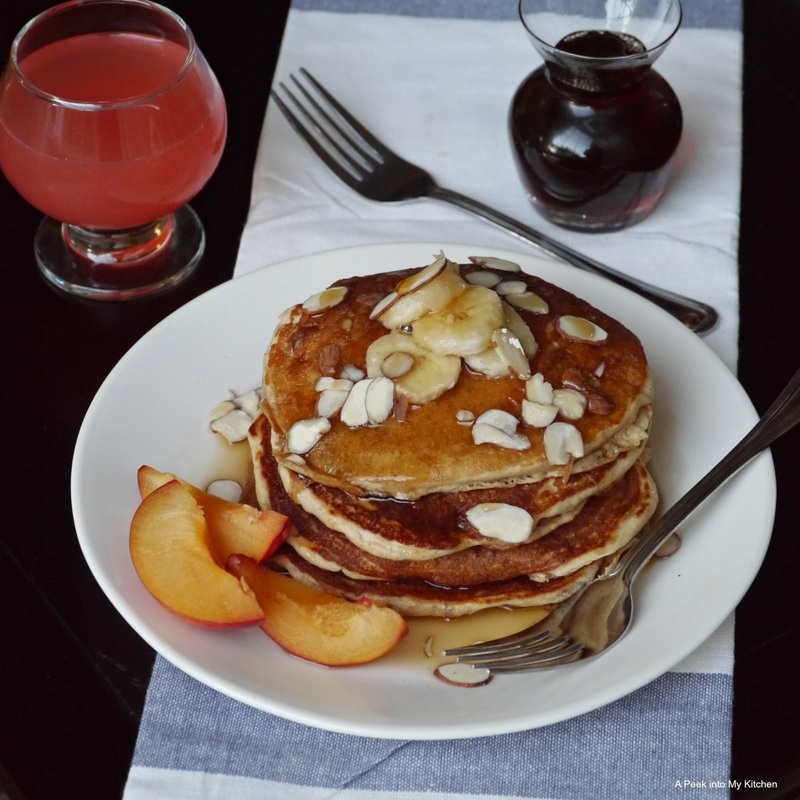 Serve the pancakes immediately drizzled with pure maple syrup and fresh fruits and nuts. 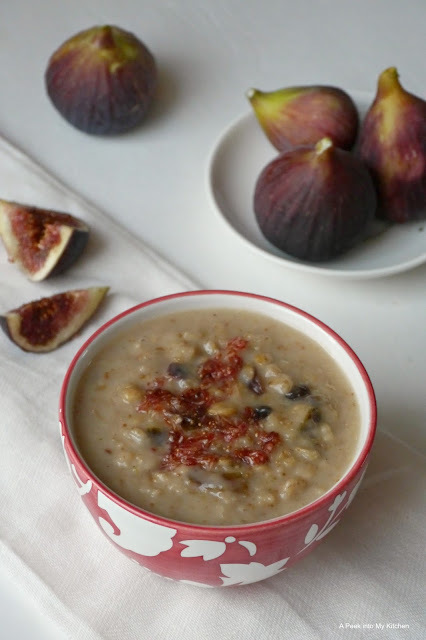 A simple and healthy oats kheer made with fresh figs straight from our backyard tree. Figs are high in fiber and boost a good source of essential vitamins and minerals. I've used condensed milk for sweetness, but you can also substitute brown sugar if you like. This makes a delicious and wholesome dish that can be devoured any time of the day. 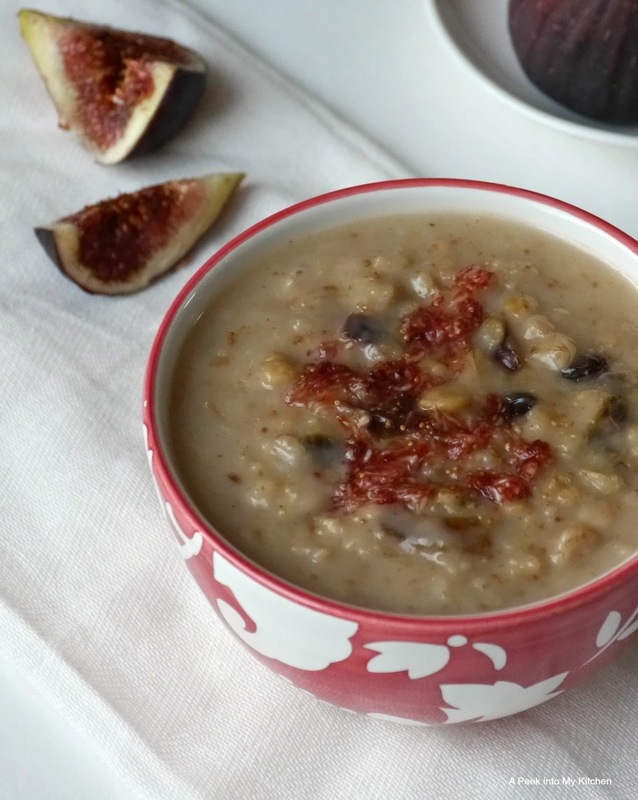 Place the oats in a saucepan and roast in 2 tsp ghee for 2 minutes over low heat. Add milk and water and cook until soft. Add the condensed milk and chopped figs. Stir well and cook for 5 minutes. If the kheer becomes thick, thin it down with some milk or water. Heat 1 tbsp ghee in a small skillet. Fry the cashews and raisins. When the raisins turn plump, remove from the heat and pour it over the oats. Mix well. Add the cardamom powder and freshly grated nutmeg. Stir to combine. 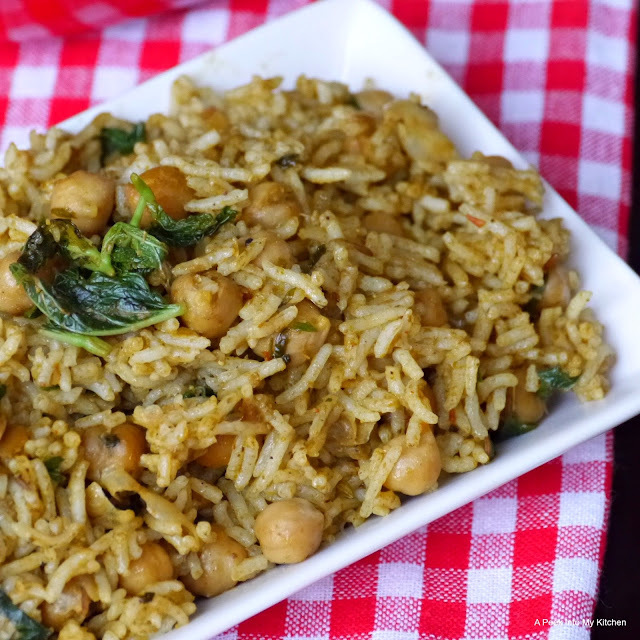 A spicy, aromatic, and flavorful biryani packed with protein-rich chickpeas. 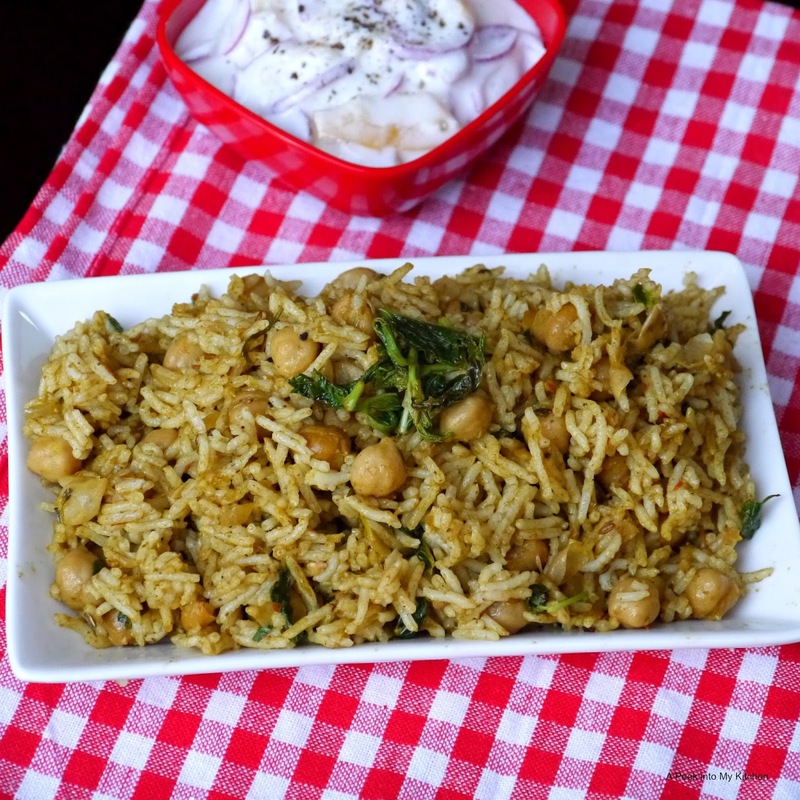 This scrumptious biryani is quick and easy to prepare and makes a great wholesome meal. Soak basmati rice for 20 minutes. Drain the water and add coconut milk and water. Cook in a pressure cooker for 3 whistles. Place all the ingredients for the biriyani masala in a blender. Grind into a thick smooth paste. Keep aside. Heat oil in a deep skillet. Add bay leaves and cumin seeds. Fry for 10 seconds. Add the onion and saute until translucent. Add turmeric powder, mint, and coriander leaves. Stir well. Add the ground biryani masala and fry until the oil separates. Add yogurt and cook for 2 minutes. Add the chickpeas and salt. Stir to combine and cook for 5 minutes. Add the cooked rice and mix gently to coat the masala. Drizzle ghee over the rice and mix gently. Serve hot with onion-tomato raita.